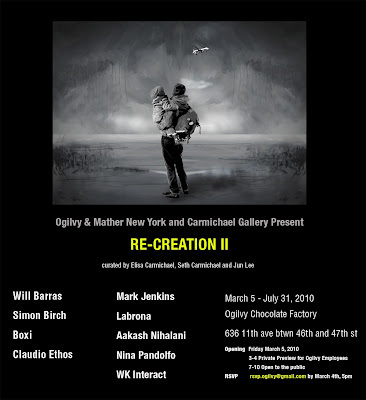 Coinciding with the Armory Art Fair, In collaboration with Carmichael Gallery, Ogilvy & Mather New York will host Re-Creation II, a global exploration of emerging art, from March 5th through July 2010. The exhibit will be held at the new Ogilvy & Mather headquarters on New York City’s West Side at 636 11th Avenue. 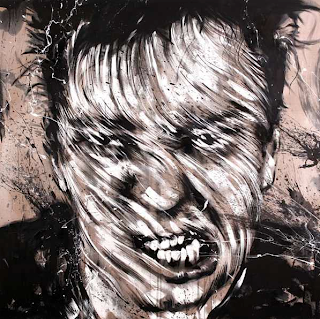 Re-Creation IIwill showcase some of the most important emerging contemporary street artists from around the world. Large-scale murals, installations and original canvas, sculpture and mixed media works will be on display from Will Barras, Simon Birch, Boxi, Ethos, Mark Jenkins, Labrona, Aakash Nihalani, Nina Pandolfo and WK Interact. 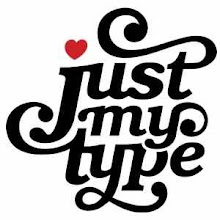 Many of these artists, who are based in the UK, Hong Kong, Germany, Brazil, the US and Canada, have never shown in New York before, and have never shown together. Ogilvy & Mather will transform six floors and the lobby space of its new headquarters in The Chocolate Factory into a museum-quality exhibition space. As viewers ascend each floor, they can experience the upward momentum of the artwork. Re-Creation II is the second exhibit to be hosted by Ogilvy & Mather in its new space. It follows the inaugural Re-Creation exhibit, which featured the work of 12 emerging artists who use recycled materials to create unique forms of art. That exhibit will also be viewable through the end of March. Carmichael Gallery is one of the world’s leading establishments for discovering and launching the careers of the best in emerging international talent. 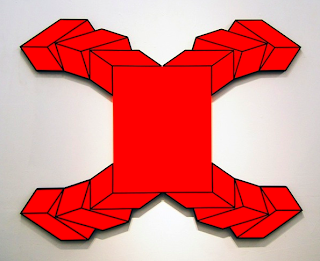 The annual program of the Los Angeles-based gallery consists of a series of solo and group exhibitions that document the progress of these artists. Carmichael Gallery is located at 5795 Washington Boulevard, Culver City CA. For more information, visit www.carmichaelgallery.com. The opening reception of the exhibit will be held on Friday, March 5 with several of the artists in attendance at Ogilvy & Mather. The exhibition will run through July 31, 2010. Opening on March 5th in the middle of the Armory Art Fair week, the exhibition will run through the end of July 2010.